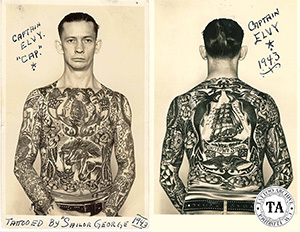 C aptain Elvy aka Elvy F. Campbell 1909-1975 was tattooed by west coast tattooist Sailor George Fosdick in 1943. Elvy’s history is not complete but it is known that he was born in Clay County, Nebraska southeast of Omaha. 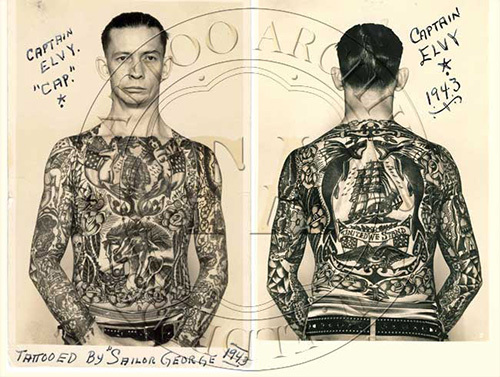 He worked as a tattoo attraction and tattooist in the 1940's and was seen with the Wallace Bros. sideshow in 1943. In a January 22, 1944 Billboard advertisement Elvy wrote, “AT LIBERTY – TATTOOED MAN AND TATTOOER. Completely tattooed new bright heavy work. State best offer with tattoo privilege. Sober and reliable. Captain Elvy, 211 S. Fryer Ave, Clay Center, NEB.